Visitors gaze at artwork on display at the Artist’s Reception for the exhibitions of Susan Groce and Antonia Small at Lord Hall Gallery on Sept. 15. Photo by Liz Theriault, Contributor. On Friday, Sept. 15, the Lord Hall Gallery held a reception for exhibitions by two of Maine’s leading artists: Susan Groce and Antonia Small. More than 75 people showed up to view the pieces and support the artists. With over 200 exhibitions under her belt, Groce is a faculty member at the University of Maine Department of Art. She has been an artist in residence, visiting artist, guest lecturer and visiting researcher at over 40 art schools and universities in Australia, Ireland, Northern Ireland, England, Scotland, Canada and the United States. At this exhibition, Groce presented her medium to large scale prints and drawings. Her work contains architectural elements in forms of various geometrical figures such as mazes. The shapes she draws are solid, sharp and structural. Yet when you take a pause and stare into the image, there is a certain fragility and grace within these rigid shapes. “It’s really fun, to work on a larger scale. It impacts the space of the viewer, you can destabilize the ground the viewer is standing in,” Groce said. Indeed, when you stroll through the gallery, you don’t simply look at these pieces, you dive into them. A printmaker at heart, Groce created her pieces with mixed media of pastel, acrylic, colored pencil and graphite. The show-stopper of this exhibition, a piece titled “Invasive Species,” is placed right on the entrance of the gallery. Visitors are immediately hit with this piece comprised of 216 intaglio-type photopolymer etchings. This body of work is a cultivation of a number of print works that Groce has done through the Royal Botanic Garden Edinburgh. Her focus is on innovative and safer print materials and processes; therefore this piece has a lot of technical research behind it. Antonia Small’s exhibit is a photo documentary of Maine’s fishing communities of Port Clyde and Monhegan Island. These black and white photographs shot on a twin-lens reflex camera tell a story of an effort to save the region’s last remaining fisheries. In 2009, Small found out about the nation’s first Community Supported Fishery (CSF) that started in Port Clyde in 2007. CSF aims to promote a collaborative relationship between fishermen, consumers and the ocean by providing locally caught seafood to the members. Overfishing and environmental changes have devastated these coastal communities, and this program is a way to alleviate the effects of overfishing. Married to a fisherman, Small knows first-hand how protective independent fishermen are of their fishing grounds. “Where they fish and what they catch is not something they will reveal to everyone,” Small said. None of the pictures that Small took were staged. These honest images reflect what she saw when she stepped into the fishing vessels, the processing plants or the dining rooms of the fishermen’s families. At first, these two exhibitions seem to have nothing in common, except for the fact that both of the artists live in Port Clyde. This factor drew Laurie Hicks, curator of the Lord Hall Gallery, to host both of the exhibitions in one space. For Hicks, the gallery is a work of art in it of itself. The same way you might describe a single work, Hicks thinks in terms of describing the whole experience of both of these exhibitions. Her favorite part in the exhibitions comes when she gets to turn around, look at the pieces and then walk away. “I know that it works,” Hicks said with a smile. 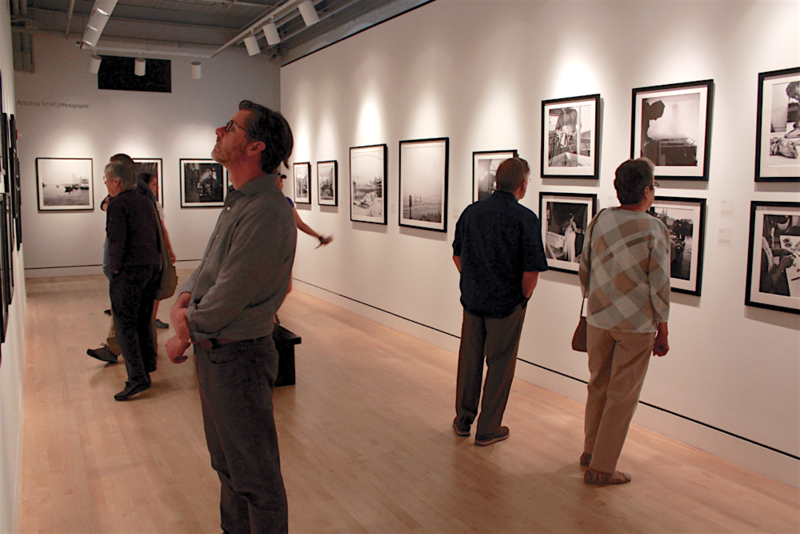 Both exhibitions are free and on display at Lord Hall Gallery until Sept. 22. The gallery is wheelchair accessible, and open Monday through Friday, from 9 a.m. to 4 p.m. The exhibition catalogues can be found in the Lord Hall Gallery website at umaine.edu/art.